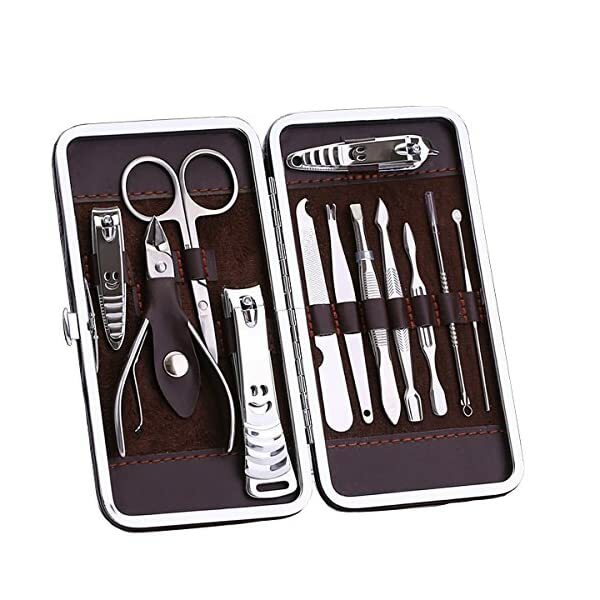 Manicure Set: This soraka Professional Manicure Kit Contains 12 pieces nail and toenail tool, can meet your needs of hand care, facial care, foot care etc. 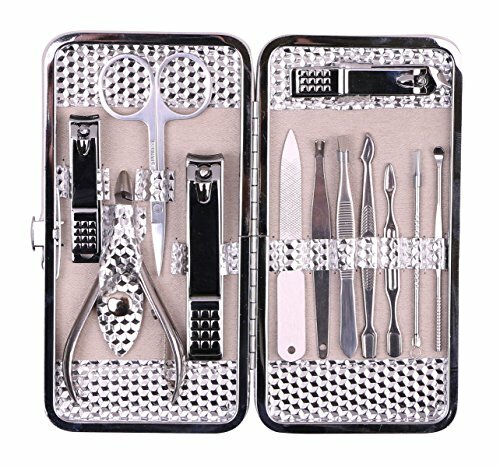 Premium Quality: manicure and pedicure tools are made of 100% professional surgical grade Stainless Steel, making sure Safe sterilization and preventing corrosion(can be used for baby). Advanced Technology and Fine craft: These tools are made through more than10 fine processes such as cutting, grinding, corrosion, laser engraving, electroplating, silk print etc. making sure its shiny look and durability. 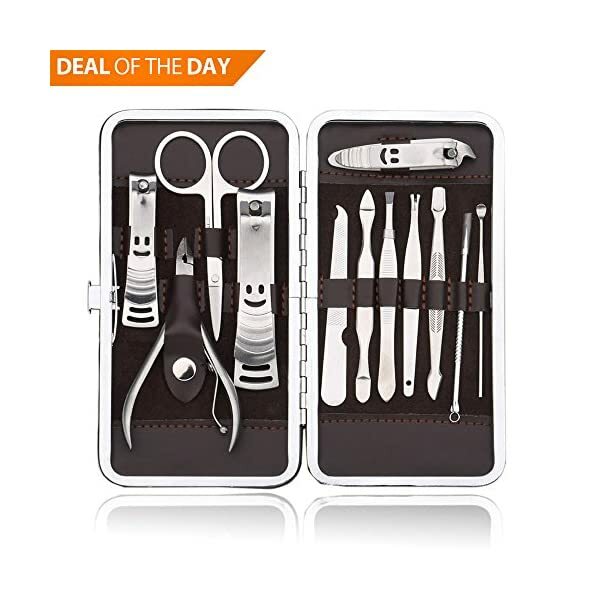 BASIC TOOLS: this professional set comes with 5 essential instruments - slim nail clipper, multi-purpose scissor, nail file, eyebrow tweezers and cuticle pusher - everything you need from a nail kit to get the ultimate results! 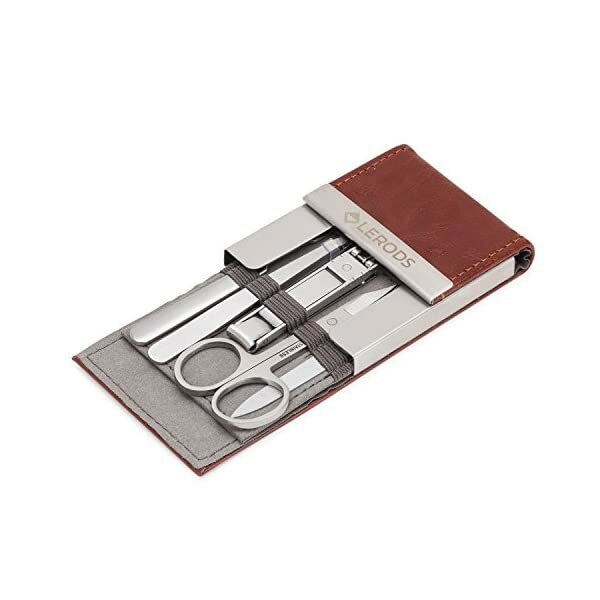 HANDY AND READY TO USE: this manicure pedicure set come with a brown leather travel case. The manicure case is 2.7 inches by 4 inches, perfect in size for a frequent traveler or someone who's simply organized. 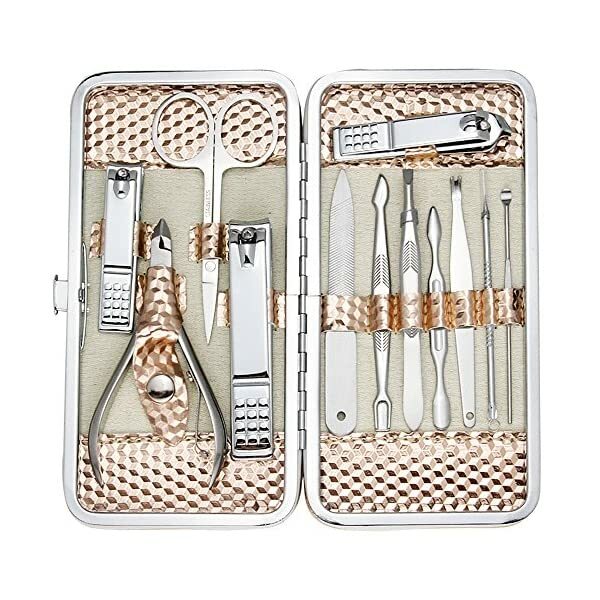 PERFECT GIFT Set: this unique design nail care set comes with a luxury LERODS gift box. Whether it's Christmas, Valentine's Day, birthday, the professional grooming kit is a best gift for mens, women and teens. 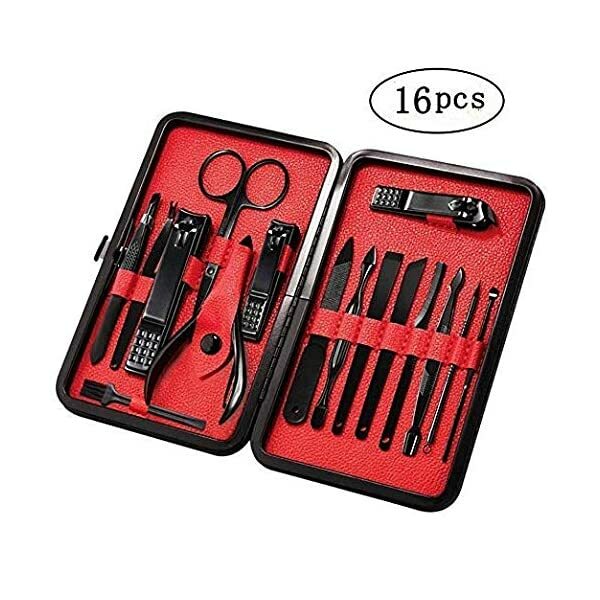 16 IN 1 SET: 16pcs Manicure Pedicure Set A care set of three functions must meet what you need, include hand care, facial care, foot care, tool cleaning brush. High Quality: Ubegood manicure & pedicure tools are made of top quality black steel, never rust, extreme hardness, black polishing anti-skid technology to allow Safe Sterilization, Prevent Corrosion and Minimize Risk of Infections. 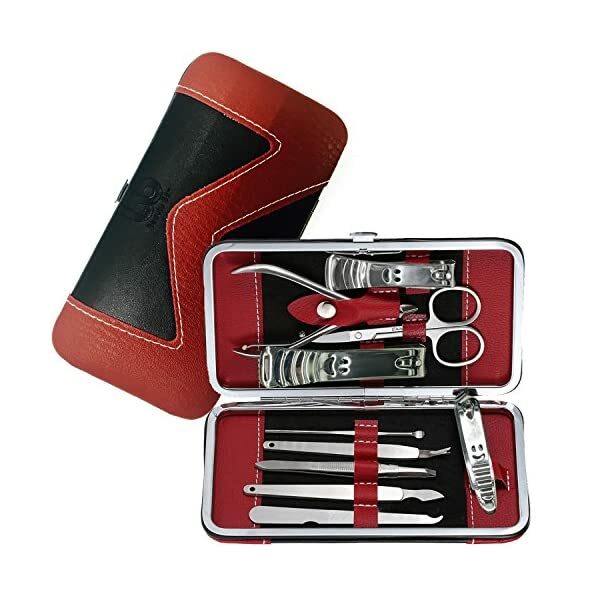 Aesthetic Design: The case of the manicure kits is made of high quality fabric and PU leather, stylish and elegant. Perfect combination of exterior and quality. 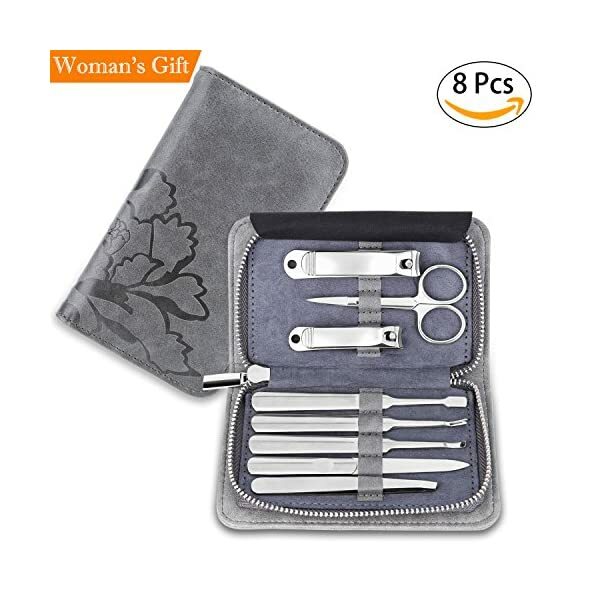 ★QUALITY IS OUR CULTURE FOREVER: RONAVO Professional manicure set of 8 in 1 are all made of High Grade Surgical Steel, Anti-Slip Lever, strong, durable and rust proof..So high quality,you can use it many years.To buy is to earn. 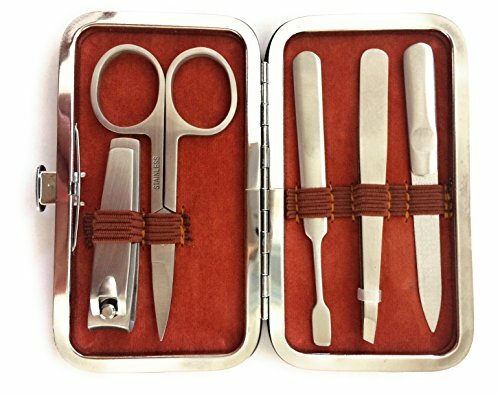 ★MANICURE SET PEDICURE KIT: Including toenail clipper,Fingernail clipper,beauty scissors for eyebrow and nose hair trimming,dead skin fork,ear pick,nail file,eyebrow tweezer,push broach. ★GREATEST GIFT:Celebration idea for all festivals including Christmas day,Thanksgiving Day,Fathers' Day,Mothers' Day,Valentine's Day New Year's Day and so on.Most meaningful gift is given to lover,families,friends .Especially High quality leather case,it makes you proud to give. KEEP YOUR NAILS LOOKING GREAT! Easy to grip nail tools keep nails neat and clean. With handles designed to be easy to hold whether fingers are wet or dry, you'll be able to easily grab the tool you need for a quick mani pedi to keep your fingernails looking great! TOP QUALITY! Made to be sturdy, strong and built to last. 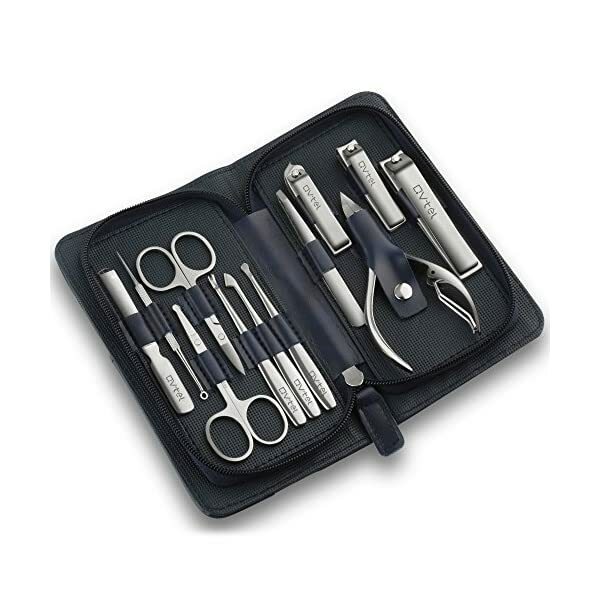 Nail clippers are precision manufactured to perfectly align the clipper blades. Nail file gently smooths nails to perfection. Tweezers are angled to easily grip small hairs or splinters. Cuticle pusher and remover is tapered with easy grip handle for easy cuticle removal. Scissors are curved and sharp with an ergonomic grip to precisely trim hairs keeping you looking beautiful.